While technological advances have been made in recent years in biometrics making them cheaper, efficient, effective and readily available, in law enforcement the use of soft biometrics, such as height, weight, ethnicity and identifying marks, is still often key to identifying suspects, according to a SPIE article. Many use systems for tattoo identification that involve sifting through a database of images via keywords describing the look of the tattoo. However, two researchers have developed a system that they believe allows for better and more efficient use of these databases. 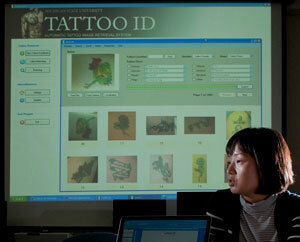 Anil Jain and Jung-Eun Lee have developed a system for tattoo identification that focuses more on color, shape and texture that they believe will allow law enforcement personnel to better ascertain the identity of suspects involved in crimes. The systems, called Tattoo-ID, operates by associating key points in the tattoo with ones in the description given yielding results on a percentage of match basis rather than simply displaying a list of tattoos that match the keyword. Although newer biometric systems are surely more effective, as many law enforcement agencies have not yet adopted biometrics, nor have many criminals had their biometric data recorded, Jain and Lee expect their system to be extremely helpful to agencies employing soft biometric procedures.